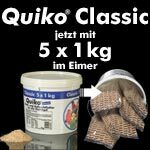 Quiko, a must for every serious bird breeder and bird owner, is an egg-based fresh food that contains the perfect combination of necessary vitamins and minerals required for the successful rearing of all types of birds. Quiko should be moistened with a little cold water to a moist, crumbly texture. Feed daily, when rearing young and during the molting period. Feed once or twice a week during the winter period. For more information contact sales@supapets-online.co.uk or phone our hotline on 01332 831300.